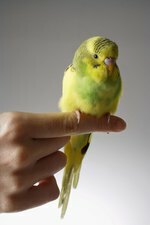 The sun conure is a breed of parrot that is popular among pet owners. 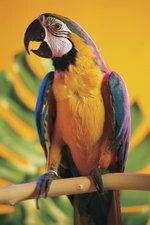 They are slightly smaller than other types of parrots and are closely related to the macaw. Sun conures have brightly colored yellow and orange feathers on their head and body from which they get their name. Determining the age of a sun conure is done primarily through examination of the feathers. The conure's feathers change in color and texture as it ages. Examine the color of the sun conure's feathers to see how many of them are a dark olive green color. If most of the feather's are olive green, then the bird is less than 6 months old. Wait for the first molting of feathers. Molting is the process of old feathers falling out and being replaced by new feathers. This occurs at approximately 7 to 8 months of age. Look for a small amount of yellow or orange on the bird's head that does not fully extend to the neck or that appears in spots. This indicates that the bird is between 7 months and 1 year old. Examine the head, neck and body for a solid yellow or orange color. This indicates that the bird is at least 1 year old. 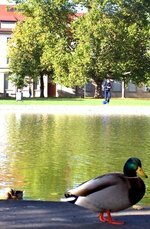 Between the ages of 1 and 2 the color will extend through the entire body of the bird, with the exception of the wings.